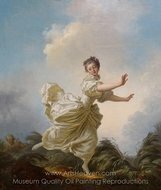 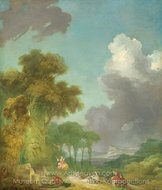 Jean-Honore Fragonard was a French painter and printmaker whose late Rococo manner was distinguished by remarkable facility, exuberance, and hedonism. 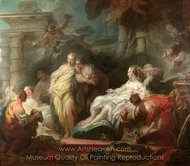 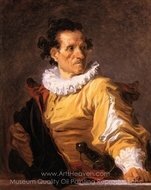 One of the most prolific artists active in the last decades of the ancient regime, Fragonard produced more than 550 paintings (not counting drawing and etchings), of which only five are dated. 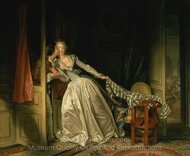 Among his most popular works are genre paintings conveying the atmosphere of intimacy and veiled eroticism. 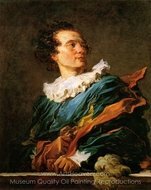 He was born at Grasse, Alpes-Maritimes, the son of a glover. 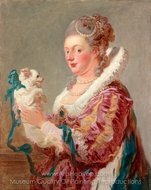 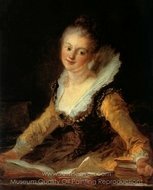 He was articled to a Paris notary when his father's circumstances became straitened through unsuccessful speculations, but he showed such talent and inclination for art that he was taken at the age of eighteen to Francois Boucher, who, recognizing the youth's rare gifts but disinclined to waste his time with one so inexperienced, sent him to Chardin's atelier. 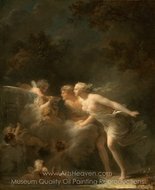 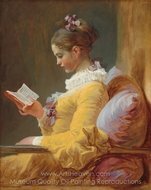 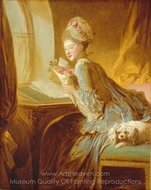 Fragonard studied for six months under the great luminist, and then returned more fully equipped to Boucher, whose style he soon acquired so completely that the master entrusted him with the execution of replicas of his paintings.